Published in the Dover Express, 30 January, 1981. The buildings on the upper part of the west side of High Street are comparatively modern. In the 18th and the early part of the 19th centuries, on the rising ground at the upper corner, facing Bridge Street, was the place of execution of the condemned felons of Dover and its Liberties. Those executions were of frequent occurrence and were very sad and revolting scenes. The central object was a poor, unfortunate person conveyed in a cart, with a coffin beside him ready to receive his body, and the Chaplain of the Corporation imparted last words of counsel and comfort to his soul. The cart so laden was surrounded and followed by an excited mob, on whom the object-lesson was supposed to have a moral effect, although often it was quite the contrary. The hanging took place on the high ground on the left entrance to Tower Hamlets Road, and the windows of the Black Horse Tavern, at the opposite comer of Tower Hamlets Road, offered a point of vantage to sightseers who did not care to jostle with the crowd. Among the executions which took place there in the early part of the 19th century, before the Municipal Reform put an end to them, were Turmain, on the 8th of March, 1813; two men for forgery on the Margate Bank, 27th November, 1817; Alexander Spence, for shooting an officer of the Coastguards, Friday, 9th August, 1822: and a young man for robbery at Margate, in 1823, was the last person executed there. In 1826, four years after the executions at Charlton ceased, Mr. Thomas Whitnall, a well-known Dover man, built a house at the top of High Street on the west side. Thomas Whitnall kept a book, in which several interesting things connected with Dover were entered. He died in 1834, and his son, Isaac Whitnall, subsequently owned the house. He appears to have continued the jottings of Dover, and from these records it appears that he seems to have got into some litigation with the revenue authorities, and a verdict was obtained against him in the Court of Exchequer, in November, 1850. Isaac Whitnall’s ownership of that house at the top of High Street, terminated on the 27th of October, 1852. Dover Hospital occupies the site of a property once known as Brook House, a large residence the seaward side of which faced a terrace of small cottages known as Victoria Row. The house was thought a good deal of when it was built by Alderman W. R. Dickenson, Paper-maker, for his residence about 1823. After he left Dover it was occupied by the Dowager Lady Knatchbull, and in 1839 by the Dowager Lady Suffield. In the early part of 1850 when the scourge of cholera was passing away in England, the people of Dover took a practical way of expressing their thanksgiving that the town had escaped the epidemic, by raising a fund to establish a Dover Hospital. There had been a Dispensary in Dover since the year 1823, and in 1850 it was resolved to incorporate that with a Hospital. There having been £1,760 raised by subscription, the committee sought for a suitable site. It was proposed to build a Hospital on St. Martin’s disused burial ground, but St. Mary’s Vestry refused to sanction that, and just about that time Brook House was offered for sale by auction, and it was acquired at a cost of £1,336, and after certain alterations it was opened on the 1st of May, 1851. At that time meadows, where cricket matches were played, joined up to the Hospital grounds: but in 1358 Wood's Meadow, as the land on each side of the Dour was called, was bought by Messrs. Nightingarl and Bushell as building land, and to prevent the Hospital from being hemmed in with buildings, half an acre of the meadow was purchased at a cost of £740. that transaction keeping the builder at bay and also providing space for the enlargement which has since taken place. It was proposed to remove the Hospital to another site in 1870, and again in 1897 it was suggested that a new building should be erected on the ground between Laureston Place and Ashen Tree Lane, but eventually it was decided to utilise the land in possession, and a fund raised by local subscription to form a permanent memorial to Queen Victoria, and to Sir Richard Dickeson, was spent in building a spacious new wing, and the enlarged building has since, by Royal warrant, been named the Royal Victoria Hospital. In 1933 another extension was erected to provide for the growing need for more hospital beds. The cost was in the region of £8,000 which was raised through an intensive campaign for donations lasting several years. High Street, on the east side, was built on land which, in 1800, was market gardens, and for some years afterwards a gardener named John Shrubshall dwelt in a cottage that adjoined the old gardens. The houses built along this line gave the idea that land was then plentiful, for they were well set back in gardens, forming pleasant residences. Among the occupiers were men well known later in Dover, Mr. H. P. Mackenzie, the restorer of the Maison Dieu, Mr Richard Dickeson, w’ho was afterwards three times Mayor of Dover and knighted for municipal services, and further up, at No. 100, used for some years as the Diocesan Men's Home, lived Mr. Going, a leading man of Charlton. Among occupiers who were long well known, in the upper part of the east side, were Mr. R. W. Pepper, at the corner of Peter Street; Mr. Stephen Read Elms, mineral water manufacturer; Mr. Griffiths, draper; and "Honest John Clark," who was thus appreciatively styled in public prints in the days when he was returned as the representative of Charlton on the Town Council and the Board of Guardians. The old residential character of the street has Quite disappeared with the growth of shops which completely swallow up what used to be a row of gardens up to the pavement. In some places these have been replaced by wide forecourts forming an extension of the pavement. This forward movement commenced before the Public Health Act enforced building regulations, No. 84, the house of Mr. E. W. Tucker, which was originally the Charlton Post Office, being one of the first to break the line. In 1872, Mr. S. R. Elms, Jun., who had a shop, the fourth house above the Post Office, thought he might also build over his garden, and having sent in plans of his proposal to the Town Council, commenced doing so. The Council refused consent, and Mr. Elms insisting on his right, the Council applied for an injunction, which was granted by virtue of a regulation which states; “It shall not be lawful . . . within the district of any Local Board to bring forward any house or building, forming any part of any street . . . beyond the front wall of the house or building on either side thereof . . . without the previous consent of such Local Board.“ Mr. Elms lost his case, and had to both pay costs and set back his front, but this decision, though strictly legal, was found to be contrary to public policy, for since that time the frontages below and several above the house in question were brought forward, and High Street became a street made up almost entirely of shops. Dover High Street when it was lined on either side by comparatively small shops, all providing a comfortable living for their proprietors. Traffic was still two-way and the odd horse and cart still regularly plied up and down the town engaged in deliveries of coal or greengrocery. The year was 1953 and the reason for the decorations all the way down to the United Reformed Church and the Town Hall on the skyline, was, of course, the Coronation of the Queen. 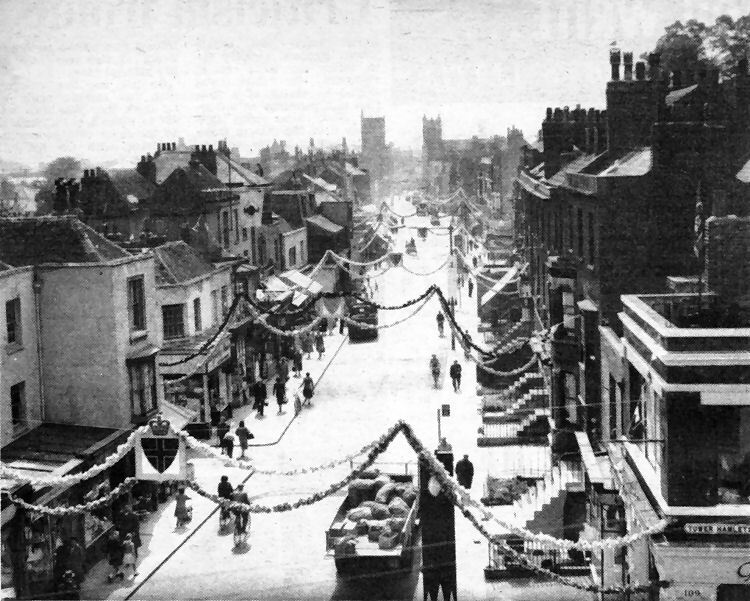 The occasion was also marked in a special way by the Dover Express which featured news on its front page for the first time, switching to inside pages the classified advertisements which normally filled the page at that time, in order to display news and pictures of festivities in Dover and surrounding district. These celebrations went on for at least three weeks.